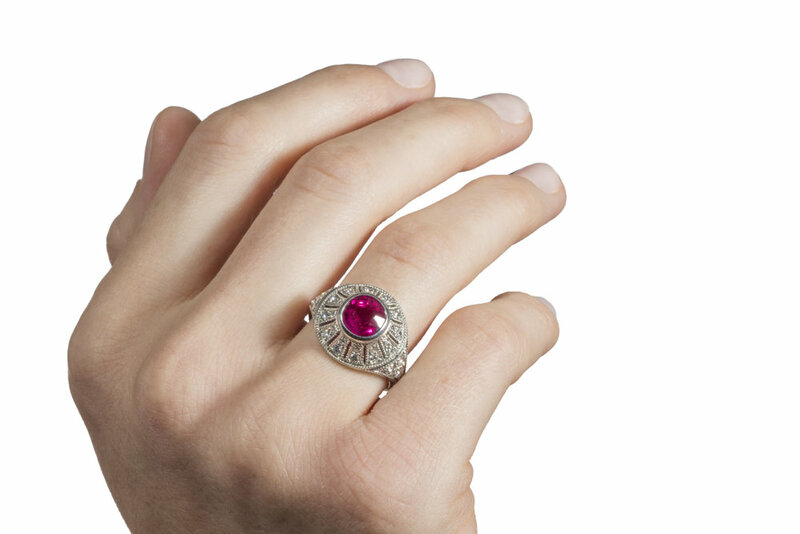 Let this Burmese Ruby, Diamond and Platinum Ring take you to a bygone era. With a strong nod to the Edwardian period, the Pigeon Blood Ruby is bezel set centered with a valance of white diamonds combining milgrain details and contrasting cut outs. Katherine LeGrand and her team of skilled craftsman created this stunning ring in their studio in Aspen, Colorado. 2.95 carats total, Ruby is 2.31 carats, intense pink-red very lightly included, Diamonds are .64 carats, E-F-G color, VS clarity.